Our manufacturing facility is functioning under the regulation of Food and Drug Administration of Provincial Government of Haryana. 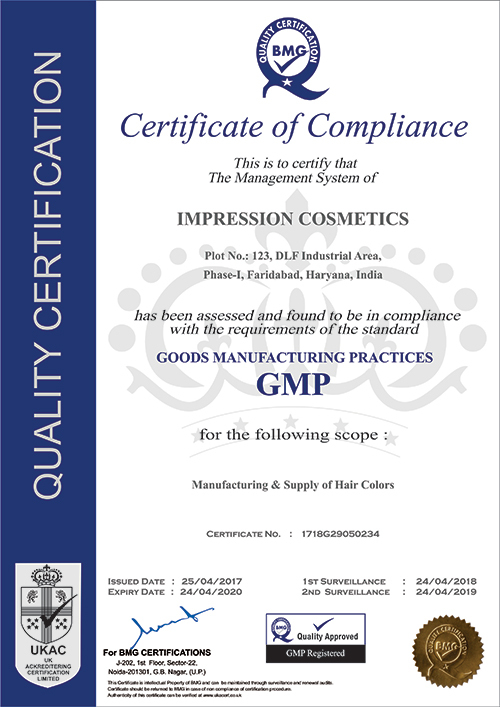 As a hallmark of quality, we have been certified with ISO 9001:2015 and GMP certifications. We are the second company in India in this line of business to be recognized by ISI. We are also certified as Halal product by the Halal Committee, India. We are dedicated to provide superior quality products through an efficient quality management system to satisfy & fulfill the requirements of our customers. All ingredients are thoroughly tested and purified by the best processes available. Each process is hygienic in nature and every effort is undertaken to preserve the natural goodness of herbs which is essential to all of our natural products. Our organization's prime concern is to offer ultimate customer satisfaction; hence, providing premium quality at most efficient prices is the major focal point. In addition with providing benefits to the customers, our company also puts extreme importance on developing cognizance among the end-users about the various advantages of herbal products for beauty and health care. Hair colour Products currently available in the market contain ingredients such as parabens, ammonia and other harmful chemicals.Since anything that we apply on our hair get absorbed by our body, we should endeavor to use products which have ingredients that do not burden the human body in any way. Only the best quality ingredients are used for our products formulation. Since our products are made from herbs, they are not known to cause any allergic reactions or premature greying. The herbs that we use are produced in the most traditional way from the wild ensuring that there is no damage to the environment in any way. We are currently in the process of acquiring "Natural Product" certification so that we can get the requisite seal of authencity for our products. It is the richest natural source of Vitamin C. It is used as a hair tonic for enriching hair growth and hair pigmentation, excellent for strengthing the roots of your hair and maintaining colour and luster. One of the prominent herbs used as an Ayurvedic medicine for treatment of hair loss, premature graying etc. It is used for the treatment of devitalized hair. Tods of this plant are used as hair wash as an alternative to soap. Shikakai promotes growth of hair and removes dandruff. An anti-inflammatory ingredient which stimulates peripheral circulation. A flower which prevents hair problems like split ends, dandruff, dryness, dullness and also adds volume. It is an stringent and has a high concentration of tennins and has such used for its dyeing properties. We have incorporated the latest technical innovations in our machineries and equipment to produce products of global standards. Our fully integrated state-of-the-art manufacturing plant at Faridabad (near New Delhi) boasts of some of the most advanced production, quality and testing capabilities in the country. We have the latest and the most efficient grinding, packing and general manufacturing equipment. Our infrastructure is well equipped with fully automatic machines for processing & packaging. There are quality testing machines available in our manufacturing unit to check the raw materials and finished products. We maintain total humidity control, which is very necessary for the life and dyeing power of our hair color. We also have a well managed inventory ensuring strict delivery date compliance. To compliment the modern infrastructure, we have a work force in place which matches the best in the industry. The R&D team focuses on the development of henna based new products and technologies, in accordance with evolving customer preferences across the globe. Our team of experienced and well-qualified technicians ensure that we are able to maintain our position of leadership in the industry. They perform a wide array of tasks, from chemical analyses of the first formulations of the color to the final technical application tests. The experts evaluate the new product with regard to user friendliness, color result, color sensitiveness and durability. The product is made available to the consumers only after this decisive phase has been completed successfully. All of our products marked with this logo were produced using plants/ herbs gathered in natural conditions of their growth. This method of gathering plants/ herbs is called Forest Extracting. The uniqueness of these plants/ herbs lies in the fact that they do not contain any harmful substances as they have grown uncultivated, in natural conditions of their growth, without any sort of outer stimulation. All of the Impression products marked with this logo were produced without the use of any chemicals or any kind of synthetic ingredients; only naturally obtained/ wild-Extracted and eco-friendly components have been used in the manufacturing process. ISO 9001 2015 is the world's most widely recognized Quality Management System (QMS) which helps organizations to meet the expectations and needs of their customers, amongst other benefits. A GMP is a system for ensuring that products are consistently produced and controlled according to quality standards. GMP covers all aspects of production from the starting materials, premises and equipment to the training and personal hygiene of staff. 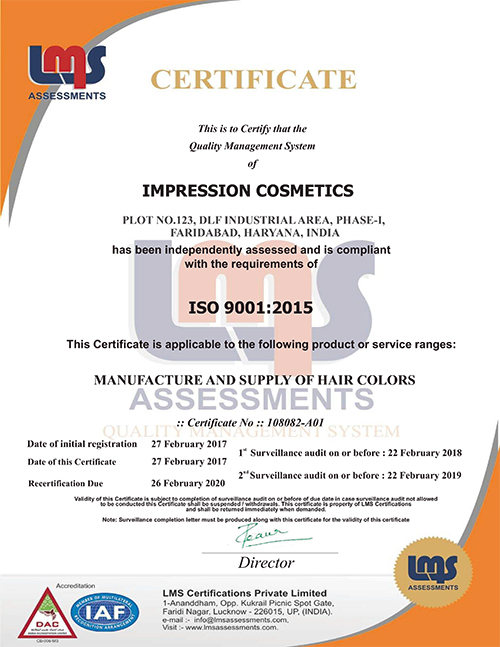 This certification helps us to make sure that every unit of our hair colour is of the same quality as the units of hair colour tested in our in house lab. Almost all Impression products fulfil the strict testing criteria of Shriram Institute (one of the leading research and testing organizations in the world) for 100% natural and chemical free products. 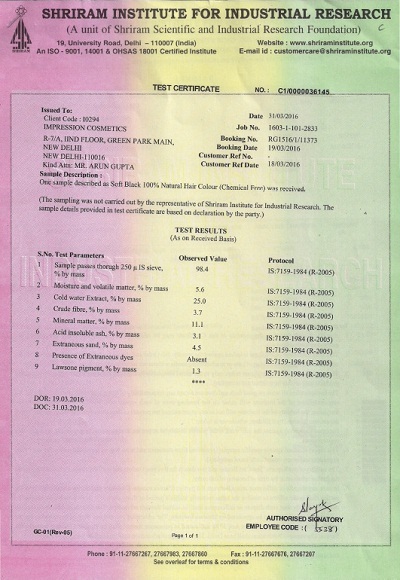 Shriram Institute is an independent, not-for-profit, self supporting research organization. You can find out more about the Shriram Institute on the internet at http://www.shriraminstitute.org/.